Immunological memory is a required component of protective antimalarial responses raised by T cell-inducing vaccines. The magnitude of ex vivo IFN-γ T cell responses is widely used to identify immunogenic vaccines although this response usually wanes and may disappear within weeks. However, protection in the field is likely to depend on durable central memory T cells that are not detected by this assay. To identify longer-lived memory T cells, PBMC from malaria-naive vaccinated volunteers who had received prime boost vaccinations with a combination of DNA and/or viral vectors encoding the multiepitope string-thrombospondin-related adhesion protein Ag were cultured in vitro with Ag for 10 days before the ELISPOT assay. Ex vivo T cell responses peaked at 7 days after the final immunization and declined substantially over 6 mo, but responses identified after T cell culture increased over the 6-mo period after the final immunization. Moreover, individual cultured ELISPOT responses at the day of challenge time point correlated significantly with degree of protection against malaria sporozoite challenge, whereas ex vivo responses did not, despite a correlation between the peak ex vivo response and magnitude of memory responses 6 mo later. This cultured assay identifies long-lasting protective T cell responses and therefore offers an attractive option for assessments of vaccine immunogenicity. One of the key components of a long-lived protective cellular immune response is the development of CD4+ and CD8+ memory T cells. In humans, differentiation of T cells has been most extensively studied in chronic viral infections. Naive cells expressing CD45RA, CD62 ligand (CD62L),4 and CCR7 traffic through secondary lymphoid organs where dendritic cells present Ag and trigger their proliferation and differentiation, resulting in primary effector cells (1, 2, 3). Once activated, these cells are able to produce IFN-γ or gain effector cytotoxic functions in response to Ag, and retain such properties even in the absence of Ag (4, 5, 6, 7). Subsequent loss of surface expression of CCR7 and CD62L enables movement from secondary lymphoid organs and allows extravasation from the vascular endothelium to locations of primary infection (8, 9). These activated effector T cells go through a contraction phase in which 90–95% of effector cells die. The remaining cells are maintained either as effector memory T cells, which act as a primary defense and can readily express IFN-γ and possess cytotoxic functions (10, 11, 12), or central memory T cells expressing the lymph node homing molecules CD62L and CCR7. These cells can produce IL-2, are capable of persisting long term in vivo, can efficiently differentiate to gain effector functions in response to Ag, and are potentially effective in mediating protective immunity (13, 14, 15, 16). Heterologous prime boost immunization regimens with vectored vaccines induce a potent ex vivo IFN-γ response. 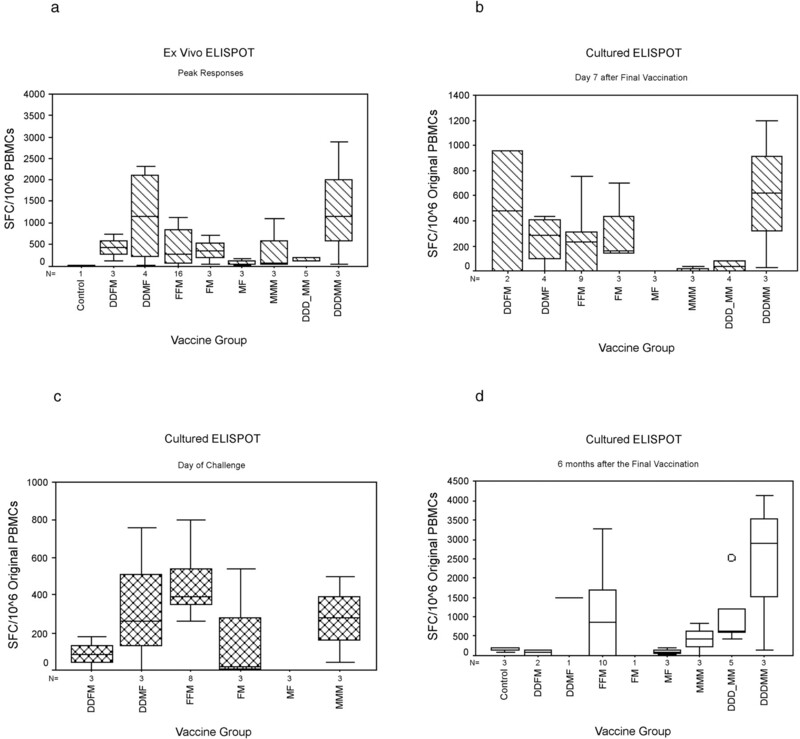 Vaccination regimens, using either plasmid DNA or a fowlpox vector (FP9) to prime, and booster vaccinations with modified vaccinia Ankara (MVA), have generated strong ex vivo IFN-γ ELISPOT responses to an insert comprising thrombospondin-related adhesion protein (TRAP), a pre-erythrocytic stage Ag of the malaria parasite, and a multiepitope string, together designated ME-TRAP (17, 18). In recent clinical studies we have shown that vaccine-induced ex vivo responses peak at 7 days after the heterologous vaccination and begin falling by 14 days. It is likely that the contracting effector population of T cells leave behind a memory population of T cells capable of responding to future antigenic challenges (19). The central memory T cells measured by cultured ELISPOT assays might be more durable than the effector population. We have shown that these two responses do not correlate in studies of responses to a pre-erythrocytic malaria Ag in malaria semi-immune African patients (20). We report on the kinetics of induction of responses measured by the cultured ELISPOT assay after vaccination with a variety of prime boost regimens and contrast this with the time course of effector T cells measured by ex vivo assays. A key question in human vaccination studies is whether the activated ex vivo cells or central memory cells measured in the cultured assay are of greater protective importance (21). In this study we compare the correlation of responses with protection as measured in sporozoite challenge studies, and find that the cultured ELISPOT assay provides a better correlate of protection. Volunteers were enrolled in a series of sequential small clinical trials to evaluate new candidate malaria vaccines (17, 18, 22). The various investigational protocols are described in detail in these reports. The Central Oxford Research Ethics Committee approved the protocols for these vaccination and challenge studies. Vaccines used in the clinical trials were approved following review of applications to the Medicines and Healthcare Products Regulatory Agency (London, U.K.) or its predecessor the Medicines Control Agency (London, U.K.), which govern the use of investigational products in the U.K. Subjects were enrolled after they had given written consent. The malaria-naive volunteers received priming and boosting immunizations encoding the TRAP from Plasmodium falciparum plus a multiple epitope string with 20 T cell and/or B cell epitopes mainly comprising 14 CD8 T cell epitopes from six pre-erythrocytic P. falciparum Ags (17, 18). Immunizations were spaced 3–4 wk apart unless otherwise stated. The vaccine regimens used were as follows: three sequential DNA immunizations at three weekly intervals followed by two recombinant MVA immunizations 3 wk later with a 3-wk interval between the two MVA immunizations (DDDMM; n = 3); the same regimen but with 8 wk between the third DNA immunization and the first MVA immunization (DDD_MM; n = 5); two sequential DNA immunizations followed by MVA and then FP9 (DDMF; n = 4); two FP9 immunizations followed by MVA (FFM; n = 16); two DNA immunizations followed by FP9 then MVA (DDFM; n = 4); a single FP9 before MVA (FM; n = 3); MVA before FP9 (MF; n = 3); and three sequential MVA immunizations (MMM; n = 3). All DNA vaccinations were 2 mg given i.m., and MVA vaccinations were 1.5 × 108 PFU and FP9 vaccinations were 1 × 108 PFU both given intradermally. All vaccinees were challenged with P. falciparum of the 3D7 strain 2–7 wk after the last vaccination as previously described (17, 18). PBMC were isolated from heparinized blood samples using Lymphoprep (Nycomed) gradient centrifugation. Mononuclear cells were counted with an automated cell counter (CasyCounter TT; Schärfe System) and resuspended in RPMI 1640 (Sigma-Aldrich) containing 1000 U/ml penicillin-streptomycin (Invitrogen Life Technologies), 20 mM l-glutamine (Sigma-Aldrich) and 10% heat-inactivated normal human AB sera (Blood Bank Service, National Health Service, U.K.). Some of the PBMC were frozen in 10% DMSO-FCS (both from Sigma-Aldrich) and stored in liquid nitrogen. In the thawing procedure 25 U/ml Benzonase nuclease (Novagen) was added to avoid cell clumping. Ex vivo ELISPOT assays were performed as previously described on fresh PBMC using MultiScreen Immobilon-P 96-well filtration plates (MAIP S45; Millipore), IFN-γ ELISPOT kits (Mabtech) and alkaline phosphatase substrate (Bio-Rad). Cells were stimulated (in duplicate wells) with 10–25 μg/ml/peptide of pools of TRAP derived 20-mer peptides overlapping by 10 aa. Spots were counted with an ELISPOT reader (AID). Ag-specific cells per 106 PBMC were calculated by subtracting spot numbers in media only wells from spot numbers in peptide-containing wells (17, 18, 23). For cultured ELISPOT, 1 × 106 cryopreserved PBMC were thawed and stimulated with 10 μg/ml/peptide of 1 pool of 57 TRAP peptides, each 20-mer overlapping by 10 aa, in 1 ml in a 24-well plate. After a 3-day incubation period at +37°C 5% CO2 atmosphere, 500 μl of the cell culture supernatant was removed and replaced with R10 (500 μl of 10 IU/ml in Lymphocult (Biotest Diagnostics) in RPMI 1640 (Sigma-Aldrich) with 10% FCS (Sigma-Aldrich)). This was repeated on day 7. On day 9 the cells were washed three times and left to rest overnight in +37°C 5% CO2 atmosphere in R10. The cultured cells are kept at the same volume throughout the culture to keep the cell numbers consistent for comparison across the individuals tested. On day 10 the cells were washed, resuspended in 2 ml of R10 and 50 μl of the cell suspension containing ∼2.5 × 104 of cultured cells was plated for a standard ELISPOT assay as described for the ex vivo ELISPOT. The number of spots in wells with media alone was subtracted from each of the peptide specific wells and results are stated as number of TRAP-specific spot forming cells per 106 originally cultured PBMC. The same individuals were tested for all time points; the assays were done based on availability of frozen PBMC. Cryopreserved PBMC from unimmunized donors and vaccinated donors 6 mo after vaccination were prepared as before, stained with 0.5 μM CFSE for 8 min, and washed with R10 to stop the reaction. Cells were then cultured at 37°C for 6 days without supplemental cytokines in R10 (Staphylococcal Enterotoxin B antagonist formula; Sigma-Aldrich) or 10 μg/ml 57 TRAP peptides. On day 6, cells were stained with anti-CD8 PerCP (BD Biosciences), anti-CD4 PE (BD Biosciences), and 7-aminoactinomycin D (7-AAD, Viaprobe; BD Biosciences). Flow cytometry was performed on a BD FACSCalibur (BD Biosciences). During the analysis, a gate was drawn to include the main PBMC population and activated cells that had changed size and granularity. 7-AAD, a dead cell exclusion marker, was used to include only the live population of cells. These were further analyzed for specific populations of proliferation. Thirteen individuals, one to three in each vaccine group, were analyzed for intracellular cytokine staining after culture (see Fig. 3⇓). After 10 days of culture, 0.5–1 × 106 PBMC were stimulated with 5 μg/ml 1 TRAP peptide pool and anti-CD28/CD49d Abs (BD Biosciences) (24). After 2-h stimulation GolgiPlug (BD Biosciences) was added and the cells were incubated for another 18 h at +37°C 5% CO2 atmosphere. After this the cells were first stained with surface marker specific Abs (anti-CD4 PE and anti-CD8 PerCP, purchased from BD Biosciences), then fixed and permeabilized with Cytofix/Cytoperm solution and stained with cytokine-specific Abs (anti-IFN-γ FITC and IL-2 allophycocyanin, all purchased from BD Biosciences). Stimulation with a streptococcal superantigen (Staphylococcal Enterotoxin B; Sigma-Aldrich) was used as a positive control for all samples. A tight gate around the PBMC population was used and at least 25,000 events were collected. Correlations and tests for significance in the comparisons of ex vivo and cultured responses were done using Spearman’s rank test. For the postculture intracellular staining experiments, log transformed cell numbers counted by FACS after intracellular cytokine staining were compared by population in a generalized linear model. Cell surface marker (i.e., CD4/CD8) and vaccine regimen were used as explanatory variables. The peak ex vivo IFN-γ ELISPOT responses were strongest in the DNA prime MVA boost group where there was a 3- or 4-wk interval between the final DNA immunization and the first MVA (Fig. 1⇓a) (17, 18, 23). This response was substantially weaker in the group that had an 8-wk delay between the final DNA and the MVA boost (18). DDFM, FFM, and FM regimens also induced strong ex vivo responses, as reported elsewhere. Seven days after vaccination, the cultured ELISPOT assay detects responses of lower overall magnitudes than the ex vivo ELISPOT assay (Fig. 1⇓b). These had increased by the day of experimental sporozoite challenge 2–7 wk after the final vaccination. The DDMF, FFM, and MMM groups gave the highest responses, whereas the DDFM, FM, and MF were low or undetectable (Fig. 1⇓c); however no samples were obtained at this time point from the DNA-MVA vaccinees. Cultured ELISPOT assays performed on cells from 6 mo after the last vaccination time point revealed surprisingly strong cultured ELISPOT responses. The strongest responses were the DDDMM, DDMF, and the FFM regimens (Fig. 1⇓d). It is possible that the sporozoite challenge procedures had contributed somewhat to the levels of these responses. Two unvaccinated but challenged individuals had responses of 60 and 200 spots per million PBMC. However, the mean and median responses in this control group were very low compared with the best prime boost vaccination responses, indicating that a single exposure to experimental challenge makes a relatively small contribution to cellular responses. Critically, the regimens that showed the strongest cultured as well as ex vivo ELISPOT responses, DDDMM, FFM, and DDMF, are those that were most protective against sporozoite challenge. Kinetics of cultured ELISPOT. a, Seven days after the heterologous vaccination, ex vivo IFN-γ ELISPOT reveals effector responses for each of the vaccine regimens. The DNA primed regimen with MVA boost gives the strongest effector responses followed by FP9 prime and MVA boost. At the same time point, a cultured ELISPOT was performed to quantify the number of memory cells present after the final vaccination. Mean responses at the DDFM and the DDDMM were the highest (b). c, At the day of challenge time point, the effector responses have contracted and after culture and the more stable memory cells differentiate to produce IFN-γ. In this group the highest responses were from the FFM, FM, and MMM regimens; DDD_MM and DDDMM were not available for this time point. At the 6-mo time point (d), a memory population is identified by cultured ELISPOT. The FFM and the regimens with DNA prime and MVA boost have the highest mean responses. Controls, malaria-naive unvaccinated but challenged individuals, give minimal responses (130 spot forming cells/106 original PBMC) at this time point. The number of individuals tested for each group is listed. In selected vaccinees, proliferation by CFSE and postculture intracellular staining was conducted to identify populations of cells that were expanding and producing effector cytokines. At the 6-mo postvaccination time point, stimulated PBMC were shown to proliferate in response to Ag. Both CD4 and CD8 populations of cells expanded to similar extents and a population of double positive cells was also identified (Fig. 2⇓). In all vaccine groups, postculture cells producing IL-2 or both IL-2 and IFN-γ were low and consistently below 200 positive cells/106 total events collected (data not shown). In contrast, postculture cells producing IFN-γ were much more variable in magnitude of response and subset of T cell responding. A generalized linear model was used to compare responses, dividing vaccination regimes into those primed by FP9 (i.e., FFM, FM, and DDFM) and those primed by DNA alone (DDDMM and DDD_MM). Intracellular staining results were also described by T cell marker (i.e., CD4, CD8, or CD4/CD8). As seen in Fig. 3⇓, higher responses for both CD4 and CD8 cells are seen from DNA primed regimens; this was significant overall (p = 0.036), but neither cell type was differentially induced (p = 0.6). Proliferation of memory cells. PBMC from vaccinees 6 mo after vaccination with regimen FFM were stained with CFSE and stimulated in vitro for 6 days. Using 7-AAD to exclude dead cells, the proliferating population of cells in this individual was found to be CD4 (38.3%), CD8 (22.8%), and CD4/CD8 double positive (7.7%) of the proliferating cells. Identification of IFN-γ-producing memory cells. After 10 days culture, cells were washed and restimulated with peptide in the presence of Golgiplug. PBMC were gated and intracellular stained for IFN-γ and IL-2. There were no significant responses in IL-2 production after stimulation. A generalized linear model was used to compare responses, dividing vaccination regimens into those primed by FP9 (i.e., FFM, FM, and DDFM) and those primed by DNA alone (DDDMM and DDD_MM). Intracellular cytokine staining results were then also described by T cell marker (i.e., CD4, CD8, or CD4/CD8). Higher responses for both CD4 and CD8 cells are seen from DNA primed regimens; this was significant overall (p = 0.036); but neither cell type was differentially induced (p = 0.6). Ex vivo responses were at their highest in all vaccine regimens 7 days after the heterologous booster vaccination. The ex vivo responses at this time point were compared with the magnitude of cultured ELISPOT responses. There is no significant correlation between peak ex vivo responses when compared with the cultured ELISPOT at 7 days, suggesting that different populations of cells are being assayed (data not shown). Effector T cells, when cultured, may apoptose. At the day of challenge time point the ex vivo ELISPOT responses are already waning whereas the cultured ELISPOT has begun to increase and is slightly higher than the cultured responses at 7 days after the final vaccination. Thus it appears that at this time between 14 and 49 days after vaccination, the activated effector cells have begun to contract and central memory cells are beginning to increase. At the 6-mo postvaccination time point, the effector responses have diminished to near baseline levels and IFN-γ production has decreased to a fraction of the peak response. At this time point the cultured ELISPOT responses are maximal. When the peak ex vivo response at 7 days after the heterologous vaccination for each participant is compared with their corresponding cultured ELISPOT response at 6 mo postvaccination, there is a highly significant correlation between the two (r = 0.596, p = 0.001) (Fig. 4⇓). This suggests that the magnitude of ex vivo responses impacts on the development of a long-term memory population of T cells. Magnitude of ex vivo response correlates with the cultured response. After comparing the magnitude of peak ex vivo responses with cultured responses 6 mo after vaccination, a highly significant correlation is found with cultured IFN-γ ELISPOT (p = 0.001). This suggests that the magnitude of ex vivo responses is strongly associated with the development of long-lasting Ag-specific T cells. In the standard sporozoite challenge model used to evaluate pre-erythrocytic malaria vaccines volunteers are challenged with five bites of Anopheles stephensi mosquitoes infected with the 3D7 laboratory strain of P. falciparum. All nonvaccinated volunteers develop malaria at a mean time of 11 days postchallenge. This period includes 6.5 days of growth within hepatocytes and 3.5 days of parasite multiplication in the blood until infection is first detected microscopically, at which point the volunteer is treated. Fully protected vaccinees fail to develop infection over a full 3-wk period of follow-up. Partially protected volunteers develop malaria later than the controls because the smaller number of parasites that leave their liver on day 6.5 require longer to reach patency despite growing at the same rate in the blood. Recent quantitative analysis of 12 hourly RT-PCR-based measurements of parasite density has allowed very precise measures of vaccine-induced reductions in liver parasite burden. For example the FFM regimen induced a 92% reduction in parasite burden compared with nonvaccinees. Although protective immunizations induce higher levels of immediate effector T cells, the magnitude of the response for each individual did not predict protection against experimental malaria from sporozoite challenge (r = −0.10, p = 0.57). However, the memory response, as detected by cultured ELISPOT, correlates significantly with delay to parasitemia following sporozoite challenge (r = 0.499, p = 0.015) (Fig. 5⇓). No correlation with protection was found for ex vivo or memory responses at any other time point. Memory cells present at day of challenge aid in the delay to parasitemia. Although ex vivo IFN-γ responses have diminished by the time of challenge, in vitro culture of these cells reveals that there is a memory population present. The number of memory cells, capable of producing IFN-γ after stimulation, significantly correlates with a delay to parasitemia as diagnosed by blood film (p = 0.015). In these studies we have identified strong effector responses that produce IFN-γ 7 days after vaccination. As Ag amount declines postvaccination, these effector cells contract to form a more stable population of memory cells ready to respond to antigenic challenge. There is no clear data as to which populations of cells are necessary for protection from human protozoan diseases; however, detailed studies have been done to identify T cells responsible for protection from disease in mice. Using adoptive transfer of T cells from leishmania protected mice; naive mice that received CD62L+ central memory T cells were protected from leishmania challenge whereas mice that received CD62L− effector T cells were not. In addition, transferred CD62L+ cells differentiated from a central memory phenotype to an effector phenotype (CD62−) during challenge (25). Similarly, we believe that central memory T cells induced by vaccination are capable of quickly differentiating into a potent effector response during malaria challenge. Recent publications found that central memory cells, identified by IFN-γ ELISPOT after differentiation and proliferation during a short culture period, are induced by a partially protective protein/adjuvant subunit vaccine and are associated with protection from malarial infection and disease in a malaria-endemic area (17, 26, 34). These vaccination studies have revealed that the sequence and number of DNA and pox viral vector vaccinations affect the magnitude of induced effector cell responses, the phenotype of responses, and the number of memory T cells (18, 23). The results demonstrate that the number of responding cells 7 days after the heterologous vaccination significantly correlates with the magnitude of memory cells seen 6 mo after vaccination. This is consistent with a model in which the effector population of cells contracts and evolves into a memory subset proportional to the initial effector peak. It is the presence of this population that then appears to mediate a subsequent protective immune response. We find that the DNA primed regimens give a strong CD4+ T cell response, whereas the fowlpox-primed regimens are more likely to give a mixed response of both CD4+ and CD8+ IFN-γ- and IL-2-producing cells. Observations on central and effector memory cells in HIV-positive individuals treated during primary HIV infection showed that those who were aviremic had T cell populations that produce IL-2 or IL-2 and IFN-γ together, whereas individuals failing therapy had short-lived T cells that produced IFN-γ alone (13). Activation-induced cell death happens rapidly in stimulated effector cells; cells that produce IL-2 before restimulation in vitro, central memory cells for example, may be more capable of self-regulating activation-induced cell death and more likely to survive overstimulation and apoptosis (27). In the cultured intracellular staining experiments there was a variable response in each of the groups. A population of cells that were CD4 and CD8 double positive T cells, as similarly observed in CFSE proliferation assays, were commonly found in all regimens as strong producers of IFN-γ. Recently, it has been shown that there is de novo expression of CD4 on CD8 cells after activation and in HIV-positive individuals, 0.7–3.3% of CD8+ T cells are double positive and most of these cells are in the memory subset (28, 29). A population of CD4+CD8+ double positive T cells has been identified as effector memory cells, is shown to control viral replication in hepatitis C virus-infected individuals and is commonly found as memory populations in other species (30, 31). In SIV challenged macaques, it is the double positive population, not the CD4+ T cells alone, that is capable of expanding in response to challenge (32). One interpretation is that this population of cells is induced after vaccination and expanded after stimulation. In contrast, T cell markers could also simply be up-regulated after in vitro stimulation and it is difficult to determine whether this is just an in vitro effect. Multiple-color flow cytometry will allow for further investigation of this cell type, to characterize its memory phenotype markers and differentiation in response to various vaccine regimens. Much emphasis has been placed on identifying the magnitude of ex vivo IFN-γ-producing cells found soon after vaccination. Although vaccine regimens that induce large numbers of IFN-γ-producing cells are identified as good candidates for new vaccine trials, these cells play one part among many factors potentially necessary for a protective immune response. Studies of vaccine- induced cellular immunity have recently begun to focus more on T cells that remain long after vaccination. Ultimately, it is the development of long-term immunity that will be essential in protection against a natural challenge of any pathogen. Therefore, the next hurdle is to identify the optimal way of measuring these cells. The detection of Ag specific T cells has been a particularly difficult challenge due to the low precursor frequency of these cells circulating in the peripheral blood. The identification of IL-7Rαhigh staining cells may be a way of distinguishing cells that will evolve into a memory population; however, with limitations on cell numbers available in a vaccine clinical study, it has proved difficult to isolate the IL-7Rαhigh population for further analysis (33). The CD8αα receptor has also been identified as a marker for memory; it can bind to a thymic leukemia molecule and this can be used to isolate CD8 memory cells. However, recent work has been limited to studying CD8αα expression in a mouse model. Memory T cells can be easily identified by memory cell markers although the Ag specificity is not known without stimulation, possibly altering the in vivo phenotype. Another alternative is to use tetramers. They are an effective way of enriching an Ag-specific population of cells although this is limited to the knowledge of HLA alleles and peptide epitope restriction. This would limit scope of individuals tested to those of known HLA types and the Ags to previously described epitopes. The cultured ELISPOT was developed following the principles of the cytotoxic T lymphocyte chromium release assay in which T cells are enriched in vitro before the killing assay is done. This method not only magnifies the response by allowing the T cells present to divide, but also enables the resting central memory T cells to differentiate into effector cells. A study by Flanagan et al. (20) comparing ex vivo, cultured ELISPOT and proliferation assays found that each assay measured a different T cell response. Reece at al. (26) has used the cultured ELISPOT as a way to identify protective correlates of immunity in an RTS,S vaccine study conducted in the Gambia. In another studying using the RTS,S subunit vaccine with various adjuvants, Sun et al. (34) found circumsporozoite specific T cells were identifiable after culture and were induced more strongly by more protective adjuvants. Webster et al. (17) describe two volunteers who were protected from malaria challenge but did not have strong ex vivo IFN-γ responses. These same individuals were found to have cultured ELISPOT responses 6 mo after the final vaccination and one individual was further protected from infection after two separate challenges. Godkin et al. (21) showed that HCV-specific cultured ELISPOT responses were dependent on CCR7+ cells present on the day of initiation of culture, and our unpublished data showed a similar result for malaria cultured responses. Malaria vaccines that yield durable responses will be necessary for long-lasting protective efficacy in the field. Detection of cellular responses by ex vivo IFN-γ after vaccination has been successful in identifying immunogenic vaccines but less successful in identifying clearly protective ones. Indeed Santra et al. (35) argued recently that the magnitude of the effector response may not be the appropriate measure for determining the potential for protective vaccine regimens based on prime boost immunization against simian HIV in macaques. We show in this study that prime boost regimens with MVA boosting in humans clearly augment long-term memory as well as effector responses but find the former to be of more protective relevance. Overall, emerging data from murine analyses (e.g., Ref.25) from field studies of correlates of protection (26), and now correlation of vaccine-induced responses with efficacy provide a compelling case for measurement of induced central memory as well as effector T cell responses in vaccine trials. We acknowledge the contribution made to this study by the research subjects who participated in these trials. We thank L. Andrews, S. Correa, A. Hunt-Cooke, H. Fletcher, A. Moore, and the Oxford HIV Vaccine Group for helpful discussions and assistance. ↵1 This work was supported by the Wellcome Trust and the Malaria Vaccine Initiative at the Program for Appropriate Technology in Health. A.V.S.H. is a Wellcome Trust Principal Research Fellow and P.B. holds a Wellcome Trust training fellowship (073597). ↵2 Current address: Department of Vaccines, GlaxoSmithKline, Piispansilta 9 A, 02230 Espoo, Finland. ↵4 Abbreviations used in this paper: CD62L, CD62 ligand; MVA, modified vaccinia Ankara; TRAP, thrombospondin-related adhesion protein; 7-AAD, 7-aminoactinomycin D.
Sallusto, F., D. Lenig, R. Forster, M. Lipp, A. Lanzavecchia. 1999. Two subsets of memory T lymphocytes with distinct homing potentials and effector functions. Nature 401:708.-712. Sallusto, F., A. Langenkamp, J. Geginat, A. Lanzavecchia. 2000. Functional subsets of memory T cells identified by CCR7 expression. Curr. Top. Microbiol. Immunol. 251:167.-171. Butcher, E. C., L. J. Picker. 1996. Lymphocyte homing and homeostasis. Science 272:60.-66. Kaech, S. M., R. Ahmed. 2003. Immunology. CD8 T cells remember with a little help. Science 300:263.-265. Mercado, R., S. Vijh, S. E. Allen, K. Kerksiek, I. M. Pilip, E. G. Pamer. 2000. Early programming of T cell populations responding to bacterial infection. J. Immunol. 165:6833.-6839.
van Stipdonk, M. J., E. E. Lemmens, S. P. Schoenberger. 2001. Naive CTLs require a single brief period of antigenic stimulation for clonal expansion and differentiation. Nat. Immunol. 2:423.-429. Badovinac, V. P., B. B. Porter, J. T. Harty. 2002. Programmed contraction of CD8+ T cells after infection. Nat. Immunol. 3:619.-626. Hamann, D., P. A. Baars, M. H. Rep, B. Hooibrink, S. R. Kerkhof-Garde, M. R. Klein, R. A. van Lier. 1997. Phenotypic and functional separation of memory and effector human CD8+ T cells. J. Exp. Med. 186:1407.-1418. Masopust, D., V. Vezys, E. J. Usherwood, L. S. Cauley, S. Olson, A. L. Marzo, R. L. Ward, D. L. Woodland, L. Lefrancois. 2004. Activated primary and memory CD8 T cells migrate to nonlymphoid tissues regardless of site of activation or tissue of origin. J. Immunol. 172:4875.-4882. Kaech, S. M., E. J. Wherry, R. Ahmed. 2002. Effector and memory T-cell differentiation: implications for vaccine development. Nat. Rev. Immunol. 2:251.-262. Seder, R. A., R. Ahmed. 2003. Similarities and differences in CD4+ and CD8+ effector and memory T cell generation. Nat. Immunol. 4:835.-842. Masopust, D., V. Vezys, A. L. Marzo, L. Lefrancois. 2001. Preferential localization of effector memory cells in nonlymphoid tissue. Science 291:2413.-2417. Younes, S. A., B. Yassine-Diab, A. R. Dumont, M. R. Boulassel, Z. Grossman, J. P. Routy, R. P. Sekaly. 2003. HIV-1 viremia prevents the establishment of interleukin 2-producing HIV-specific memory CD4+ T cells endowed with proliferative capacity. J. Exp. Med. 198:1909.-1922. Wherry, E. J., V. Teichgraber, T. C. Becker, D. Masopust, S. M. Kaech, R. Antia, U. H. von Andrian, R. Ahmed. 2003. Lineage relationship and protective immunity of memory CD8 T cell subsets. Nat. Immunol. 4:225.-234. Sprent, J.. 2002. T memory cells: quality not quantity. Curr. Biol. 12:R174.-R176. Sallusto, F., J. Geginat, A. Lanzavecchia. 2004. Central memory and effector memory T cell subsets: function, generation, and maintenance. Annu. Rev. Immunol. 22:745.-763. Webster, D. P., S. Dunachie, J. M. Vuola, T. Berthoud, S. Keating, S. M. Laidlaw, S. J. McConkey, I. Poulton, L. Andrews, R. F. Andersen, et al 2005. Enhanced T cell-mediated protection against malaria in human challenges by using the recombinant poxviruses FP9 and modified vaccinia virus Ankara. Proc. Natl. Acad. Sci. USA 102:4836.-4841. McConkey, S. J., W. H. Reece, V. S. Moorthy, D. Webster, S. Dunachie, G. Butcher, J. M. Vuola, T. J. Blanchard, P. Gothard, K. Watkins, et al 2003. Enhanced T-cell immunogenicity of plasmid DNA vaccines boosted by recombinant modified vaccinia virus Ankara in humans. Nat. Med. 9:729.-735. Grayson, J. M., L. E. Harrington, J. G. Lanier, E. J. Wherry, R. Ahmed. 2002. Differential sensitivity of naive and memory CD8+ T cells to apoptosis in vivo. J. Immunol. 169:3760.-3770. Flanagan, K. L., E. A. Lee, M. B. Gravenor, W. H. Reece, B. C. Urban, T. Doherty, K. A. Bojang, M. Pinder, A. V. Hill, M. Plebanski. 2001. Unique T cell effector functions elicited by Plasmodium falciparum epitopes in malaria-exposed Africans tested by three T cell assays. J. Immunol. 167:4729.-4737. Godkin, A. J., H. C. Thomas, P. J. Openshaw. 2002. Evolution of epitope-specific memory CD4+ T cells after clearance of hepatitis C virus. J. Immunol. 169:2210.-2214. Moorthy, V. S., S. McConkey, M. Roberts, P. Gothard, N. Arulanantham, P. Degano, J. Schneider, C. Hannan, M. Roy, S. C. Gilbert, et al 2003. Safety of DNA and modified vaccinia virus Ankara vaccines against liver-stage P. falciparum malaria in non-immune volunteers. Vaccine 21:1995.-2002. Vuola, J. M., S. Keating, D. P. Webster, T. Berthoud, S. Dunachie, S. C. Gilbert, A. V. Hill. 2005. Differential immunogenicity of various heterologous prime-boost vaccine regimens using DNA and viral vectors in healthy volunteers. J. Immunol. 174:449.-455. Suni, M. A., L. J. Picker, V. C. Maino. 1998. 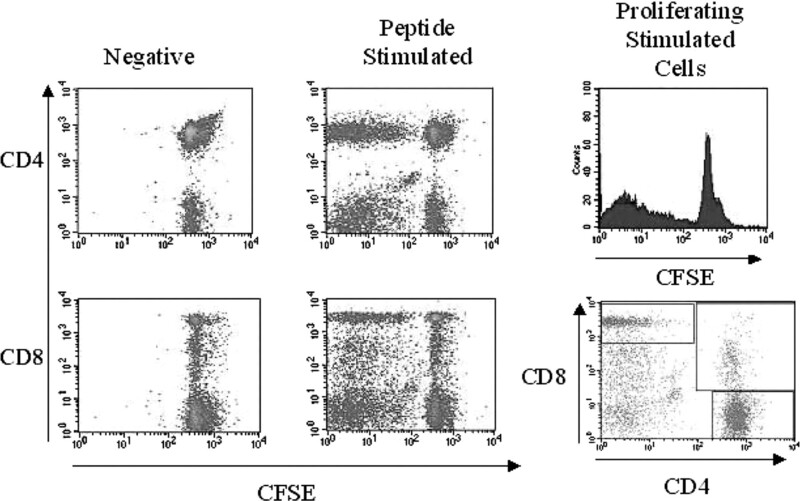 Detection of antigen-specific T cell cytokine expression in whole blood by flow cytometry. J. Immunol. Methods. 212:89.-98. Zaph, C., J. Uzonna, S. M. Beverley, P. Scott. 2004. Central memory T cells mediate long-term immunity to Leishmania major in the absence of persistent parasites. Nat. Med. 10:1104.-1110. Reece, W. H., M. Pinder, P. K. Gothard, P. Milligan, K. Bojang, T. Doherty, M. Plebanski, P. Akinwunmi, S. Everaere, K. R. Watkins, et al 2004. A CD4+ T-cell immune response to a conserved epitope in the circumsporozoite protein correlates with protection from natural Plasmodium falciparum infection and disease. Nat. Med. 10:406.-410. Carter, L. L., X. Zhang, C. Dubey, P. Rogers, L. Tsui, S. L. Swain. 1998. Regulation of T cell subsets from naive to memory. J. Immunother. 21:181.-187. Cochrane, A., S. Imlach, C. Leen, G. Scott, D. Kennedy, P. Simmonds. 2004. High levels of human immunodeficiency virus infection of CD8 lymphocytes expressing CD4 in vivo. J. Virol. 78:9862.-9871. Kitchen, S. G., N. R. Jones, S. LaForge, J. K. Whitmire, B. A. Vu, Z. Galic, D. G. Brooks, S. J. Brown, C. M. Kitchen, J. A. Zack. 2004. CD4 on CD8+ T cells directly enhances effector function and is a target for HIV infection. Proc. Natl. Acad. Sci. USA 101:8727.-8732. Nascimbeni, M., E.-C. Shin, L. Chiriboga, D. E. Kleiner, B. Rehermann. 2004. Peripheral CD4+CD8+ T cells are differentiated effector memory cells with antiviral functions. Blood 104:478.-486. Zuckermann, F. A.. 1999. Extrathymic CD4/CD8 double positive T cells. Vet. Immunol. Immunopathol. 72:55.-66. Akari, H., K. H. Nam, K. Mori, I. Otani, H. Shibata, A. Adachi, K. Terao, Y. Yoshikawa. 1999. 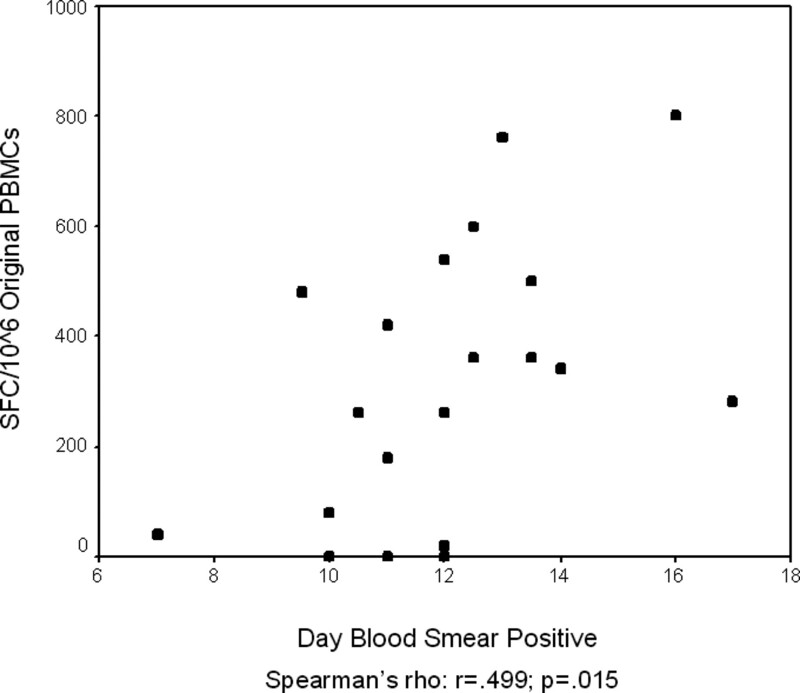 Effects of SIVmac infection on peripheral blood CD4+CD8+ T lymphocytes in cynomolgus macaques. Clin. Immunol. 91:321.-329. Kaech, S. M., J. T. Tan, E. J. Wherry, B. T. Konieczny, C. D. Surh, R. Ahmed. 2003. Selective expression of the interleukin 7 receptor identifies effector CD8 T cells that give rise to long-lived memory cells. Nat. Immunol. 4:1191.-1198. Sun, P., R. Schwenk, K. White, J. A. Stoute, J. Cohen, W. R. Ballou, G. Voss, K. E. Kester, D. G. Heppner, U. Krzych. 2003. Protective immunity induced with malaria vaccine, RTS,S, is linked to Plasmodium falciparum circumsporozoite protein-specific CD4+ and CD8+ T cells producing IFN-γ. J. Immunol. 171:6961.-6967. Santra, S., D. H. Barouch, B. Korioth-Schmitz, C. I. Lord, G. R. Krivulka, F. Yu, M. H. Beddall, D. A. Gorgone, M. A. Lifton, A. Miura, V. Philippon, K. Manson, P. D. Markham, J. Parrish, M. J. Kuroda, J. E. Schmitz, R. S. Gelman, J. W. Shiver, D. C. Montefiori, D. Panicali, N. L. Letvin. 2004. Recombinant poxvirus boosting of DNA-primed rhesus monkeys augments peak but not memory T lymphocyte responses. Proc. Natl. Acad. Sci. USA 101:11088.-11093.